"For me, the sky is astrophysics… It's the scientific explanation for the wanderings of our imagination beyond the screen of our sky." Oh my, this looks gorgeous. 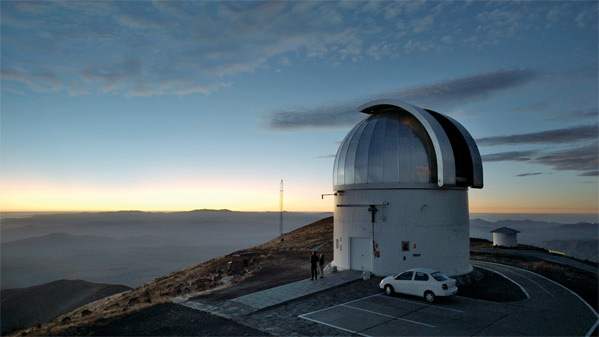 An official trailer has debuted for a documentary film titled Cielo, an examination of the skies and "heavens" above Chile. Made by Alison McAlpine, the film focuses on a few observatories and telescopes located in Chile, where the sky "is more urgent than the land." As a huge fan of stars and the universe beyond our planet, I'm immediately attracted to this film and can't wait to see the footage. For more info on the technical details and how they got all the footage, visit the official website. This is premiering at the New York Film Festival this weekend, and will probably show at a few other festivals before hitting cinemas. I feel like this film demands to be seen on a giant screen. Dive in. The first feature from Alison McAlpine, director of the beautiful 2008 "nonfiction ghost story" short Second Sight, is a dialogue with the heavens—in this case, the heavens above the Andes and the Atacama Desert in northern Chile, where the sky "is more urgent than the land." McAlpine keeps the vast galaxies above and beyond in a delicate balance with the earthbound world of people, gently alighting on the desert- and mountain-dwelling astronomers, fishermen, miners, and cowboys who live their lives with reverence and awe for the skies. Cielo itself is an act of reverence and awe, and its sense of wonder ranges from the intimate and human to the vast and inhuman. Cielo is directed by filmmaker Alison McAlpine, of the short Second Sight previously now making her feature debut. This will premiere at the New York Film Festival this weekend. The film still doesn't have an official release date set yet. Who wants to see this film?